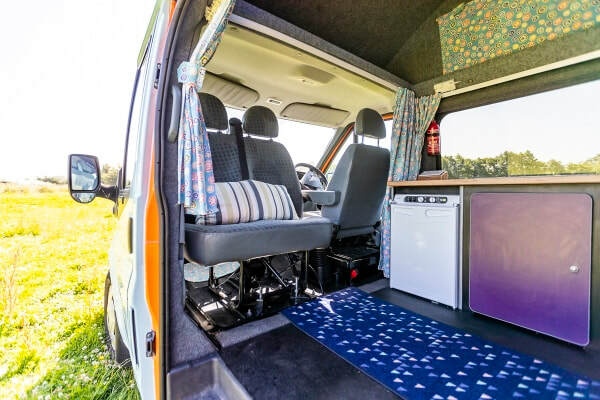 Lula the Ford Transit campervan - Wanderlust Camper Co.
Meet Lula, our compact, pet-loving campervan, she really is the perfect size for a roadtrip. 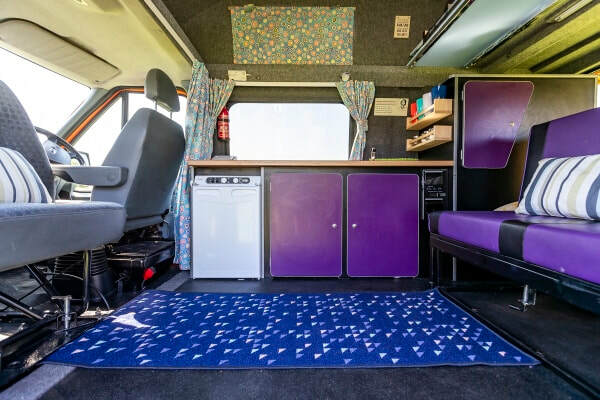 She has 5 belted travel seats to keep you safe, an extra seat-belt clip for a dog, a fab kitchen and is happy to house a family of 4/5 with younger children or 4 adults internally. For additional sleeping / living options, request our event shelter or pop-up tent. Sociable Lula's has a great seating area made from the second row of travel seats - which doubles as a sofa for 2 - and the passenger seat when swivelled round. The perfect space for reminiscing about the day's adventures. 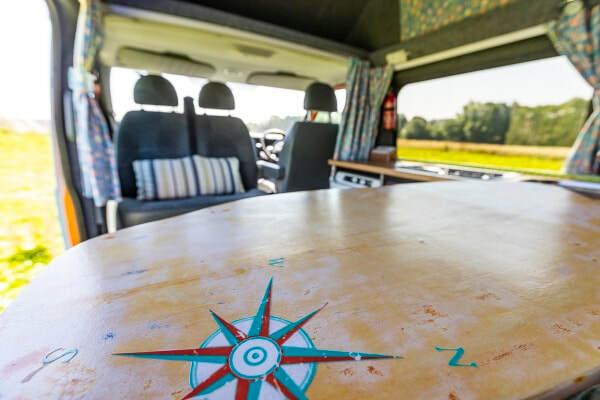 Lula loves the holiday vibe, so it's no surprise that her small dining table is in the style of a surf board - easy to store away when not in use. ​ The fab individual LED lighting can be altered, perfect when you don't want to disturb anyone who has fallen asleep early after a day of adventuring, or for creating a special mood. Lights run from the leisure battery as well as mains hook-up so Lula can be used both on and off-grid. Lula's sleeping arrangements consist of 2 double beds. 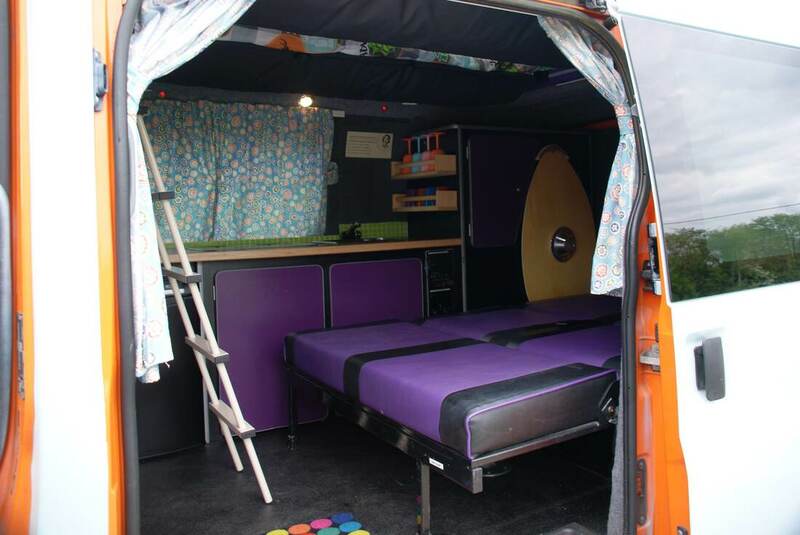 The lower bed is a traditional rock n' roll style bed for 2. (a safety net is provided). The roof bed slides back and stacks for day time use. Each bed has it's own lighting. 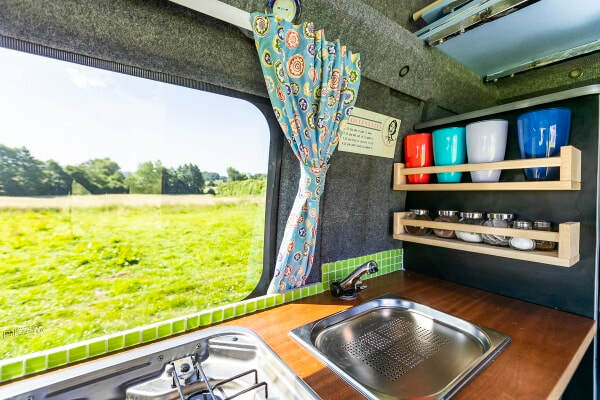 Lula's kitchen has a 3-way fridge (12v, mains and gas) so it can run without electric hook-up, two gas hobs and a sink with over-sink drainer. You can store your goodies in the under counter cupboards with shelving compartments. The gas and on-board fresh water tank are also housed here. 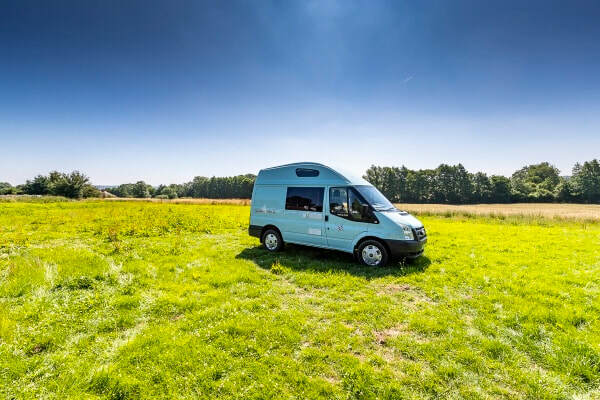 We recommend electric hook-up if you're with Lula for more than 3 nights in one-spot. 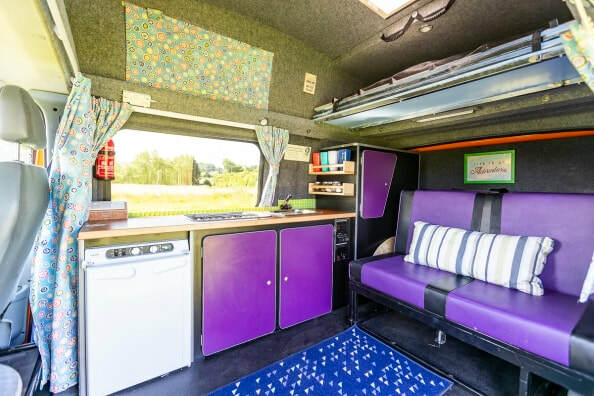 Her clever well-thought out storage features consists of a wardrobe / cupboard with rear and side access, a generous space above the cab, plus under-bed storage. The reverse side of the rock n roll sofa provides even more storage space when the sofa is in its upright position. Lula's cab has a CD / radio / auxilary input for playing music when driving. Lula also has 2 USB charging points and electric sockets (on hook-up). BRING ALONG YOUR DOG WITH LULA!! Pets are welcome in Lula, but as she is a bit snug we recommend one well-behaved dog, or cat (if you want to squeeze two with you, your dogs would need to be both small!) 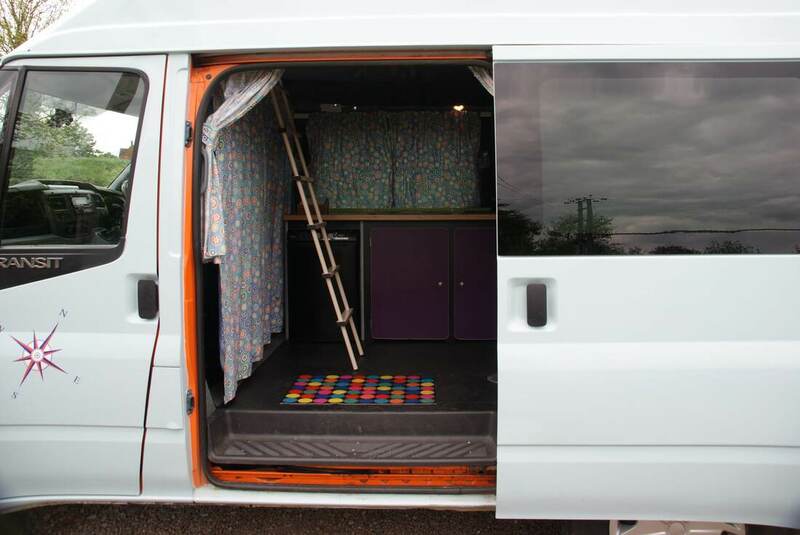 Lula is easy to keep clean and we ask that you try to keep her clean as possible. Lula doesn't like being scratched or having wet dogs on her lovely seats - so please respect her wishes! Just bring along their favourite food and their travel safe equipment. We charge an additional cleaning fee for pets, this is added when you add a dog to your booking. We charge for unauthorised pets if we find pet hairs - so please add as an additional upfront for the most cost effective way of bringing your pet with you. These can be added with our online booking or over the phone. View extras on the link below. 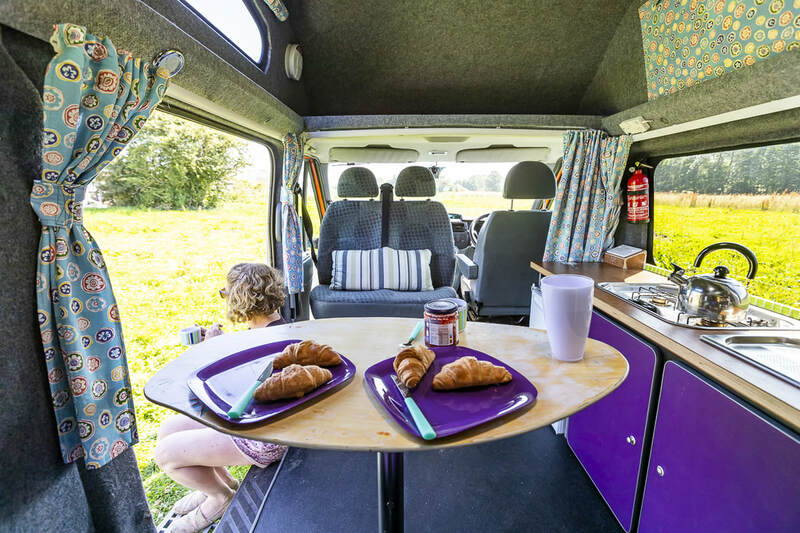 Using an electric hook-up at a campsite is recommended for optimum performance as it provides additional benefits such as 2 mains electric sockets for powering and recharging electric items. We also have some home comforts you can use at no additional charge (but subject to availability so please ask at time of booking!) such as a toaster, kettle, slow cooker and mini electric radiator. Insurance is included for 2 drivers aged between 25-75 with a clean licence. Drivers outside of these parameters may be possible with an additional premium, please ask prior to booking. Drivers must have 2 years driving experience and will need to provide a valid driving licence upon collection, plus 2 items of identification (details sent with booking) . In the unlikely event of breakdown, cover is included for your reassurance. Ford Transit. Fuel: Diesel. Manual 5 gear. Bed for 2 made from the rock n roll seats. 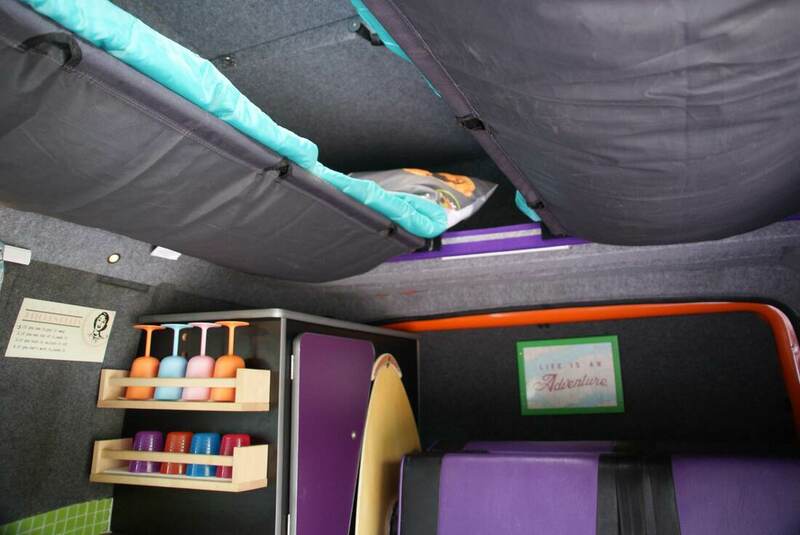 Roof bed in high top for 2 adults or 3 kids (Approx 5'9 x 5'). Please note there is limited headroom in the roof bed. Additional sleeping via the optional drive-away awning. Collection is from 4pm and drop-off is before 11am, unless otherwise agreed in advance. ​and at the owners own risk, for one vehicle per rental.